The Voice's Top 10 artists performed live for home viewer votes and several artists shined with their emotional, vulnerable performances during Monday night's two-hour broadcast on NBC. 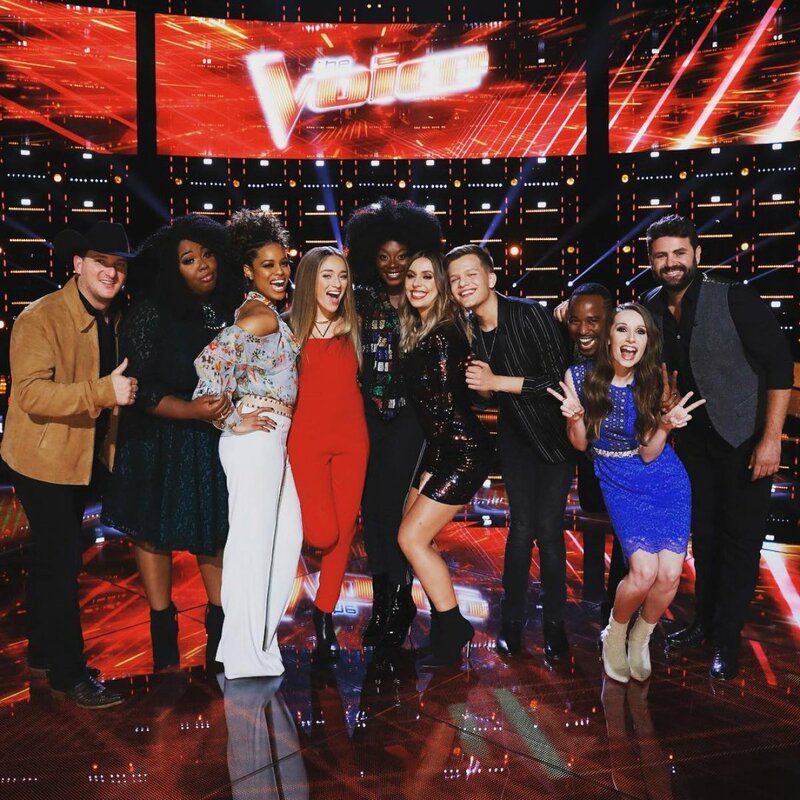 The Top 10 artists for Season 14 are Rayshun Lamarr and Jackie Verna on coach Adam Levine's team; Jackie Foster, Britton Buchanan and Christiana Danielle on coach Alicia Keys' team; Kyla Jade, Spensha Baker and Pryor Baird on coach Blake Shelton's team; and Kaleb Lee and Brynn Cartelli on coach Kelly Clarkson's team. Kyla, a 33-year-old from Nashville, TN; Spensha, a 25-year-old from Boerne, TX; Jackie Foster, a 22-year-old from Boston, MA; and Brynn, a 14-year-old from Longmeadow, MA, showed new sides of themselves last night through their song choices. Kyla performed "This Is Me" by Keala Settle from The Greatest Showman, which is a song very near and dear to her heart, and she received a standing ovation from all four coaches. "Kyla, you are stunning, riveting, masterful and magnificent," Alicia gushed, adding that she's "a glorious goddess" who "showed everybody what's possible." Blake said everyone heard and felt Kyla's message, telling his team member, "I'm pretty sure you just punched your ticket for the semifinals, so congratulations." Spensha sang "Red" by Taylor Swift and also earned a standing ovation from all four coaches. This was the first time Spensha attempted a pop-country tune, and her attempt was obviously successful. Adam noted how Spensha can sing all the notes but also connect with people and that she's doing exactly what she's meant to be doing. After Adam noted her "instincts are amazing," Blake called "Red" her "best performance so far on the show." "You're going to make country-music history. You're going to be a star in country music. I know it in my heart and I can't believe I got to be an itty bitty part of it. This is unbelievable," Blake told the artist. Jackie Foster took the stage with "Gravity" by Sara Bareilles, and it was the first time viewers saw this sweet and stripped-down version of this powerhouse vocalist. Alicia complimented Jackie's strength, saying she delivered "a beautiful vocal and a gorgeous performance." The coach also thanked her team member for being so open and vulnerable for the audience. Brynn performed "Fix You" by Coldplay in honor of her mother. Kelly said it's an amazing thing to watch someone deliver a message as well as she did, with such spirit and emotion. Kelly called Brynn "an innate artist" and insisted she was born to sing and speak to others through her music. "You are an anomaly. You're special," Kelly noted. Jackie Verna, a 23-year-old from West Chester, PA, found her "sweet spot" in her voice by singing "Love Triangle" by RaeLynn. Blake said Jackie really hit home with that performance and her delivery of the lyric was incredible. Adam told home viewers that sometimes "a subtle, refined, elegant and perfect vocal can get lost in the shuffle" on The Voice but Jackie deserves to be remembered and rewarded for her unique performance. Christiana, a 22-year-old from Fort Wayne, IN, also slowed things down with "Ain't No Sunshine" by Bill Withers. Kelly gushed about how the song was really beautiful and Christiana has the ability to sing with her "whole body" as if she's "a living, breathing orchestra." Alicia admitted Christiana is one of the most unique and special beings she has ever come across or met. "You didn't see anything like this on the show today," Alicia insisted. "You are the only one." Britton, an 18-year-old from Sanford, NC, also wowed the coaches with his rendition of "What's Love Got To Do With It" by Tina Turner. Adam said the song spoke directly to his soul because his heart broke the minute Britton did not join his team. Adam revealed he's a believer in Britton and so proud of him. "You are swagging so hard right now... your swag is on 30 million and you are so unique!" Alicia gushed, adding Britton has had "exponential growth" in just a few weeks and he's "spectacular." Rayshun, a 33-year-old from Fort Washington, MD, sang "Grant Green" by Mr. Jukes featuring Charles Bradley. Kelly had so much fun watching Rayshun perform, calling him "infectious." Rayshun's coach Adam then told him, "You separated yourself from the pack today in a way that I think is really profound. If you all are looking for your star, this is the dude. I don't know who else can entertain the way you entertain." Pryor, a 35-year-old from Nashville, TN, also never seems to let people down when it comes to entertaining a crowd. Pryor took the stage with "My Town" by Montgomery Gentry, and Adam loved hearing more range in his voice given he's "the best screamer ever." Adam admitted Pryor's vocals last night were "eye opening and ear opening" experiences. Blake added that music fans are starting to realize how rare his voice is, telling his team member, "I will not be surprised to see you go beyond Top 3 this week. I'm seeing two or one." And Kaleb, a 32-year-old from Ormond Beach, FL, was voted "most improved" after singing "Boondocks" by Little Big Town. Adam called the performance "phenomenal" and told the artist: "Regardless of the outcome, you win in a way," when thinking about his growth throughout The Voice competition. Kelly also gushed about her team member, saying Kaleb is a great dude, a solid singer and a great entertainer all around. During The Voice's next results show on Tuesday night, two artists will be going home based on home viewer votes no matter what team they are on.